Helping primary school teachers build confidence in a young girls' digital future. If the word 'coding' sounds intimidating for non-tech people, then perhaps the fact that a group of five to eight-year-olds learnt to code and build a game in just one day might make the concept less overwhelming. 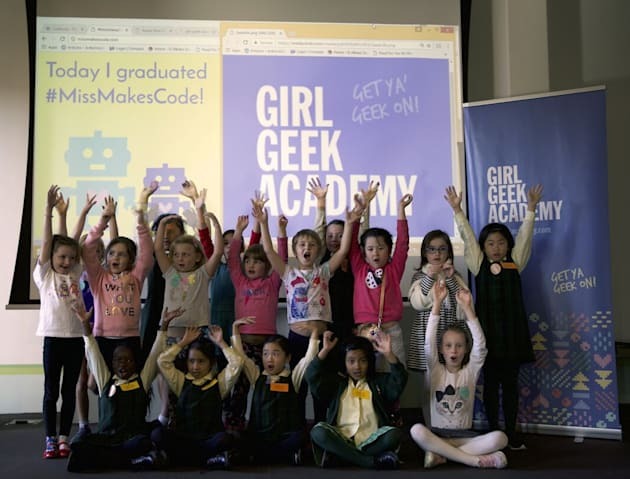 The team at Girl Geek Academy has launched its #MissMakesCode teacher training program - calling on 1,000 primary school teachers to unite and teach Australian girls coding at an early age. Research shows exposure to gender bias begins around the age of six, so the initiative is all about introducing young girls to technology as early as possible so they don't label it as a skill that is more for boys. It's also a way to make technology a native skill, just like reading and writing. To make coding fun for girls, the trick is to make it very social. 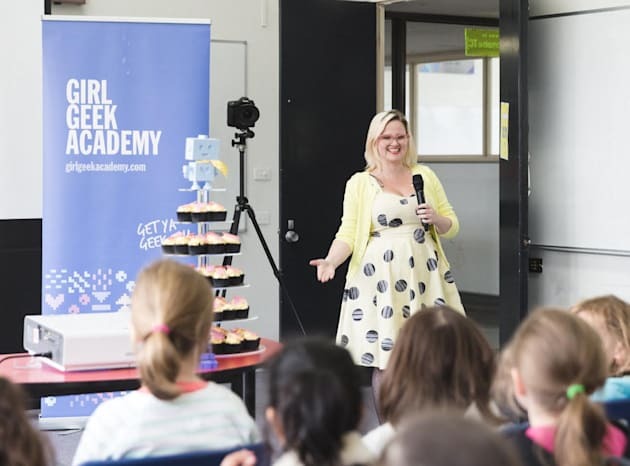 Girl Geek Academy CEO Sarah Moran told HuffPost Australia #MissMakesCode is the first initiative in the world created to build confidence and self-efficacy in the areas of algorithmic thinking, programming and coding for young girls. "It's so important that girls learn coding so they get the digital confidence they'll carry through their education. We know that it's easier to engage girls in technology before they have been exposed to any gender bias," Moran said. "From a young age girls already have gendered beliefs about intelligence and they're more likely to avoid games meant for 'really, really smart' children'. We already hear words from girls in the classroom like, 'I'm not smart enough' and that's something they'll carry through their whole education," Moran said. These 5-8 year olds were excited to learn all about coding. "What we focus on is a confidence building exercise that teaches the girls resilience because they're solving problems. When young girls learn to code and problem solve, it gives them all the digital confidence that allows them to be successful from the age of five onwards." More than 20 Sydney school girls, aged between five and eight, attended a special workshop hosted by Girl Geek Academy, where they were taught coding in just one day. Moran said the secret to making the workshops fun for the girls is to make it very social. "There were several girls who had only met each other that day, who loved being paired and working together, so that some of them left the workshop as 'best friends!'" Moran said. Girl Geek Academy strongly advocate for the upskilling of teachers to boost their own careers and increase the number of girls pursuing tech careers by adding an art and design element to the traditional STEM focus. Girl Geek Academy CEO Sarah Moran chatting to the kids about coding. "We're technologists and we like to have impact that's scaleable and the most scaleable asset we have is our teachers. So we need to make sure teachers are feeling confident to create an environment where young girls can learn. The large percentage of teachers are women, who are these girls' first role models," Moran said. "The teachers need as much confidence in the digital world as anyone else. It's a small amount of training for a large amount of impact." 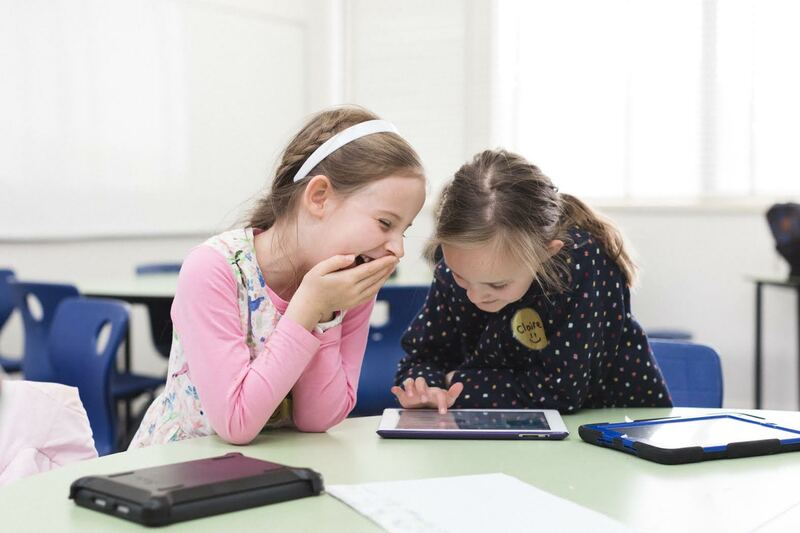 Girl Geek Academy recognises that girls love being paired with a friend to learn coding together. The MissMakesCode program is written and delivered by teachers, for teachers and aligned to the Australian Digital Technologies curriculum. On completion of the course, teachers will be equipped with the resources needed to deliver the curriculum the very next day. The program is now open for teacher signups via its website. The first teacher training workshop will take place in Melbourne on 27 July, 2017.